Li Shui Jin Yang is located in Tie Xi district, a suburban town approximately 20 kilometres from the west of Shenyang city, Liaoning province. This project is situated in the Shenyang Tie Xi Economic and Technological Development Zone. With a site area of approximately 9 hectares, this high-rise condominium project consists of 23 blocks of 2,450 residential apartments with total area of approximately 200,000 square metres, one hotel and 51 retail shop units with total area of approximately 11,200 square metres. 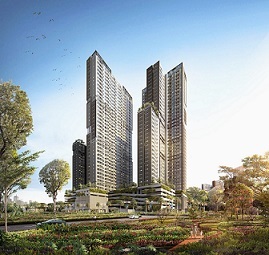 It aims to convey a northern royal garden concept of a relaxed lifestyle with a modern concept and good feng shui. This project is developed in several phases and stages. Phase 1 comprising a total 1,052 residential units, was about 97% sold as of 31 December 2011.